“Where’s my dream of India?” This is the question posed by Xandria’s latest musical offering, where India, with its faraway exotic appeal, is used as a metaphor for that special “spark” everyone seeks in their life -- you know, enlightenment or spiritual purpose or inner peace, or whatever it is that you might contrast with the disappointments and dreary grind of day-to-day material life. It’s a bold concept to hang an album on, but I suppose the band handles their chosen theme well enough, even if somewhat loosely, with generally well-written and thoughtful lyrics. On the other hand, though, there is much more that goes into making a good album than just lyrics, and not everything here stands up to careful scrutiny. 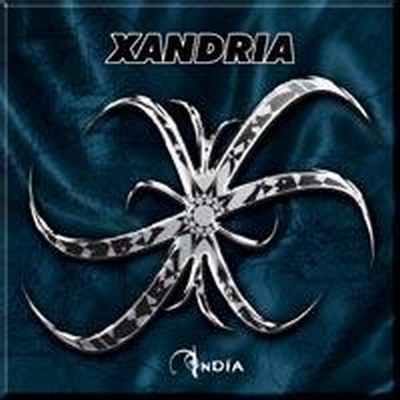 For those familiar with Xandria’s previous work, your opinion of them (whatever that may be) is not likely to change after hearing India, since it is very much in line with past albums as far as the general sound and quality. I guess there’s something to be said for consistency. Xandria have been consistent in creating music in the “decent” to “good” range, but this is now their third album of such music and at this point I would hope for a band to show some growth. Unfortunately, Xandria have not managed to raise the bar for themselves, and in fact I detect a slight trend in the opposite direction. While there isn’t a whole lot of distance between albums, I’d still take their debut Kill the Sun as their best work to date. Still in play are the elements you’d expect from this band: heavy driving guitars, catchy melodies, straightforward and upbeat music, and Lisa’s charming vocal qualities. The biggest difference this time around is the use of the Deutsches Film Orchestra to add a symphonic component which gives off a slightly eastern feel, in keeping with the album’s chosen metaphor. Thus, India sounds overall more “epic” than previous efforts, although somehow this doesn’t equate to “better”. Don’t get me wrong, the symphonic parts are quite good, but just not good enough to pull the album as a whole up to a higher plateau. This attempt at an epic sound comes nowhere near to failing, mind you, but neither does it achieve the glorious heights that, presumably, it sets out to reach. The album starts off fairly strong and stays that way through the first four songs. The opening title track is one of the most symphonic, straying a bit into Epica or After Forever territory. The next three songs hearken back to the best material from Xandria’s previous albums and are certainly the best on this one. Now and Forever is a euphoric love song about someone who has found (or think they’ve found) ultimate peace by finding their soul-mate. That sounds sappy, huh? Ok, but it sounds convincing enough in the song, and the music even more so. In Love With the Darkness follows a similar pattern -- lyrics that are not overly deep but are sung convincingly -- and has some very nice symphonic touches. Fight Me sounds a little more serious with a weightier guitar presence and a darker attitude. This song tells of a struggle with “obscurity, a nameless Force”, the very enemy of meaning and purpose in life that the album is all about. If this initial trend had continued this would have been a better album, but as Yeats would tell us, the center cannot hold. Black and Silver actually has to be the worst song I’ve ever heard from this band, with no redeeming qualities whatsoever, and The End of Every Story isn’t much better. Who We Are is almost totally uninspiring from a musical angle, and this is a real shame since it showcases some of the best lyrics of the whole album, having the kind of grand “human condition” subject matter that you’d expect to hear in some Broadway musical: “Who we are / and who we want to be / is not the same all the time / and what we say / and what we want to say / is not the same sometimes.” It’s just too bad the music doesn’t match the sweep of the lyrics. We also get two very painful attempts at ballads, Like A Rose on the Grave of Love (not sure I could think of a worse title if I tried) and Dancer. Someone in the band apparently keeps up with the Journal of Sleep Research, and has applied that knowledge in the construction of these songs, for sleep-inducing is exactly what they are. The one brighter spot in the middle of the album is Widescreen, a catchy energetic song about our conformist and media-driven society: “Watching it on widescreen all the time / bringing our lives into one line / fashion be my guide / reflections of what they want us to be.” And, since I sympathize with the message so much, I’ll inflict still more of it on you: “Downfall of visions and dreams, gotta have all / like lemmings we rush for the roll call / deprived of all we stand for / united we stand as a main bore / just numbers, no names on this dead score.” There, ponder that for a while, why don’t you? With a strong beginning and ending, this album shows Xandria has what it takes to make great music, but apparently this is applied somewhat selectively to various songs. The middle half of this album pretty much falls apart, pulling its overall effect down significantly. The curious thing about this band is how some songs can carry a sense of conviction and feeling, while others sound so artificial and emotionless. Like each Xandria album before, there are certainly parts of this one that are nice to listen to. But I’m still waiting for an album that I can describe without such qualifications, one that simply blows me away. It hasn’t happened yet, but I suppose it’s still possible.